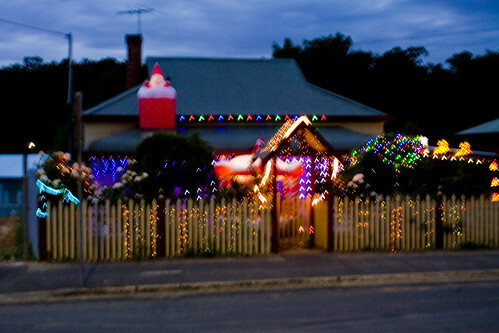 A town near Adelaide called Lobethal is really busy this time of year because many houses within the town decorate their houses and yards with Christmas themed lights. I’ve been meaning to go for a while but only got around to it a this week. 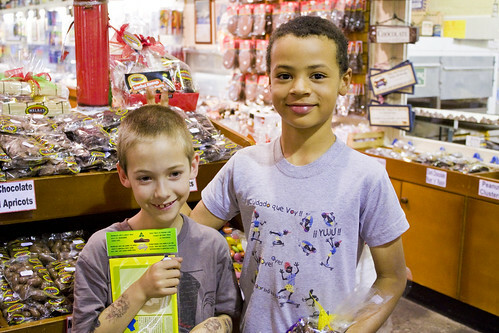 We went with a couple of friends and visited Melba’s Chocolate factory first off. I can’t believe I live this close to a chocolate factory and have never been there. But I live closer to Haigh’s and I’ve never been there either. The boys had a great time. When I first saw this photo I thought JJ had his arm around his mate, but look a bit closer. We continued to Lobethal and because it was a few hours until dark and light-up time we had dinner at the pub. I pity the couple nearby who were probably looking forward to a peaceful dinner as it wasn’t to be with foghorn leghorn (my son) and his noisy mate both trying to outdo each other. There’s other things to do before the lights go on in Lobethal at this time of year like a market in the hall which we had a look at but there’s only so much to look at before the kids run amok. 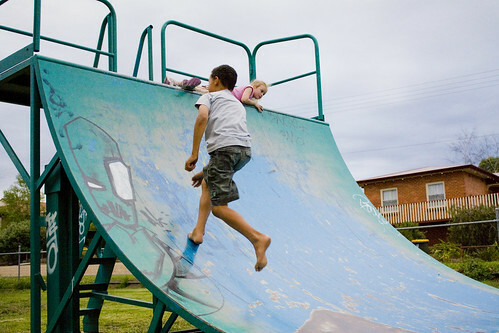 So we took them to the playground at the oval to get rid of some energy. 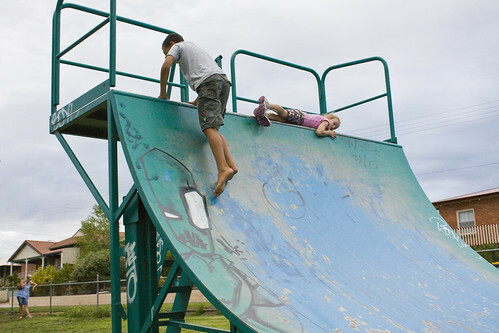 A heap of kids used this skate ramp as a slippery dip before the bigger kids came along with skateboards and scooters. And then finally it got dark enough to enjoy the lights. 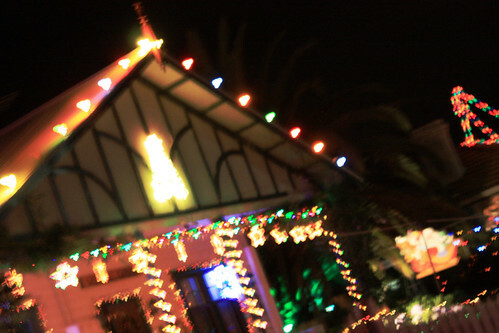 We walked around for a bit before we got in the car and joined the other hoards to look at lights around the town. We spoke to a man who’d been decorating his house for about 30 years and asked him how long the town had been doing it. He said that after World War II that it was a way for people to try and brighten things up around the place and to try and forget the war. We walked in our door at home about 10.45pm absolutely worn out. I hope you all have a lovely Christmas. We’re off to my family’s for Christmas day and will be watching the christmas parade tonight in the town where my parents live. It will probably be yet another late night for us. I love Christmas lights…we have some good ones here. Have a great Christmas! I can see what he was up to in that photo – boys will be boys!!! I hope you had a wonderful Christmas and that 2010 is a fabulous year for you and your family!